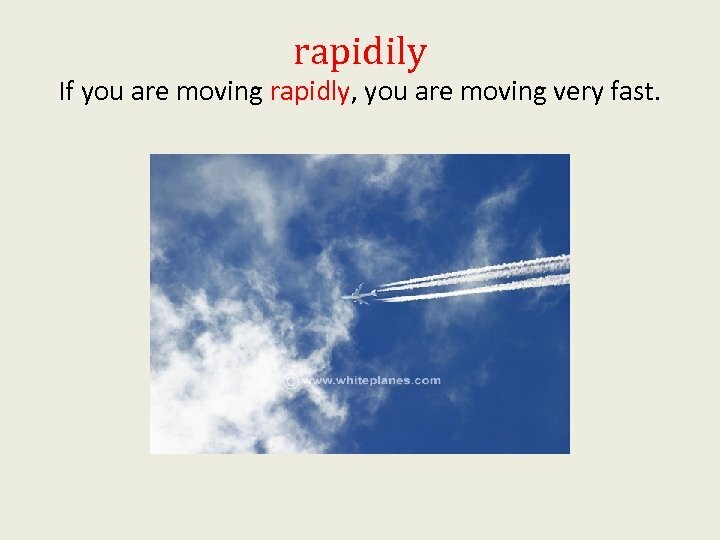 rapidily If you are moving rapidly, you are moving very fast. rapidly The animals walked rapidly. When there is a fire drill, we should leave our classroom safely and rapidly. If my mom calls me to help her, should I move slowly or rapidly? Why? 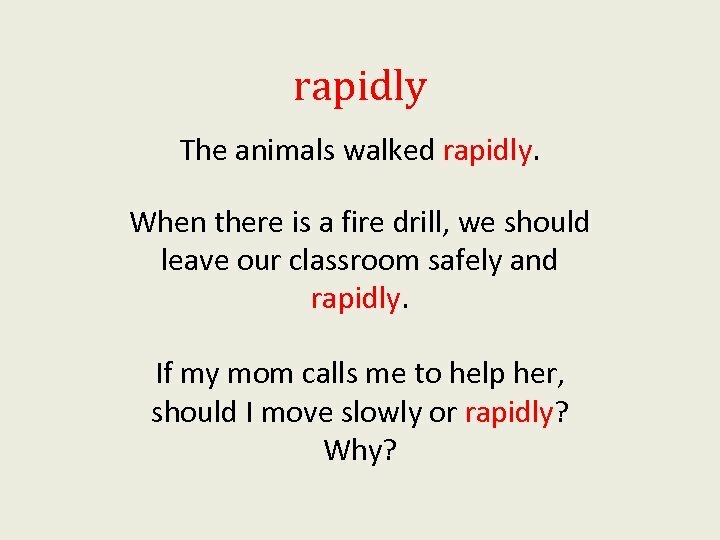 rapidly What happens rapidly in school? What things do you wish happened more rapidly? 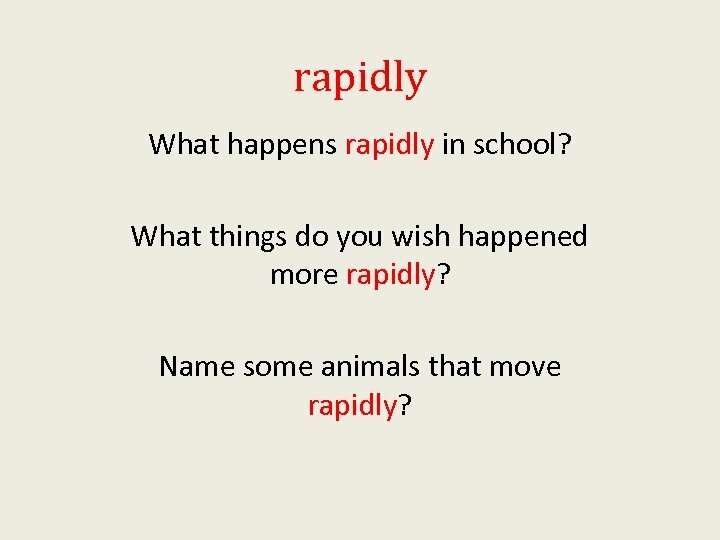 Name some animals that move rapidly? 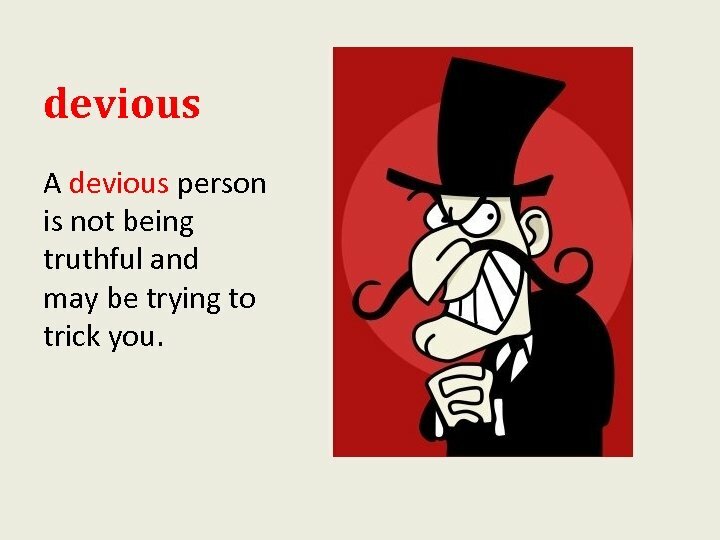 devious A devious person is not being truthful and may be trying to trick you. devious Foxy Loxy was very devious because he was planning to gobble up the birds. If I got you to do my work by pretending it was fun, would that be kind or devious? Why? devious If I give everyone a new pencil, am I devious? Why? Zach pretended to not see the mess because he hoped someone else would clean up. 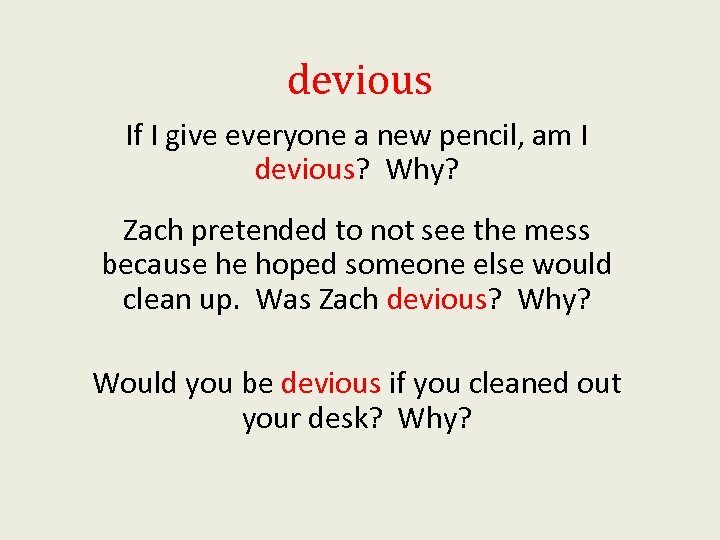 Was Zach devious? Why? Would you be devious if you cleaned out your desk? Why? 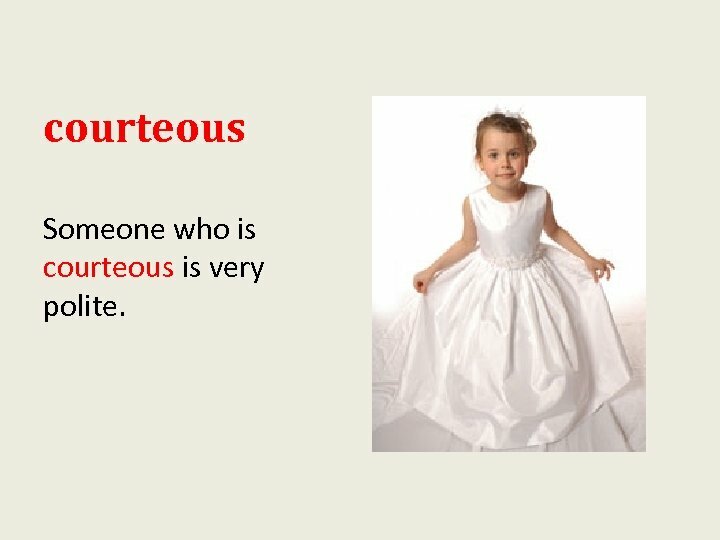 courteous Someone who is courteous is very polite. 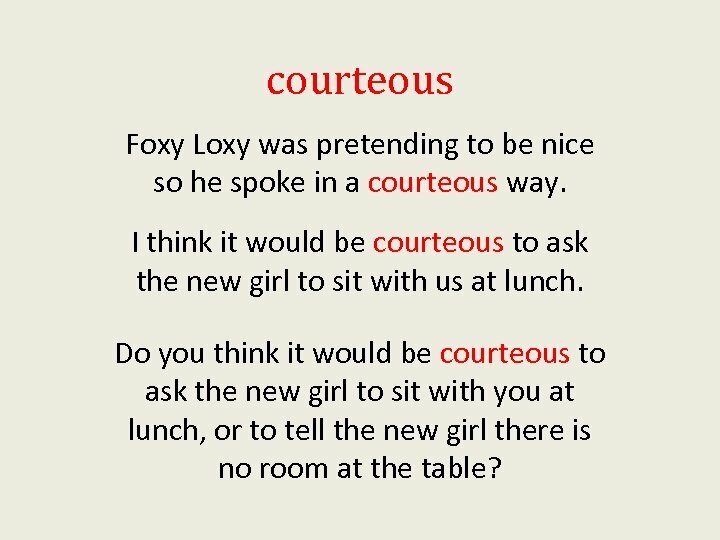 courteous Foxy Loxy was pretending to be nice so he spoke in a courteous way. I think it would be courteous to ask the new girl to sit with us at lunch. Do you think it would be courteous to ask the new girl to sit with you at lunch, or to tell the new girl there is no room at the table? courteous If you always say please and thank you, would you be courteous? Why? What is a courteous thing you could do for a friend? 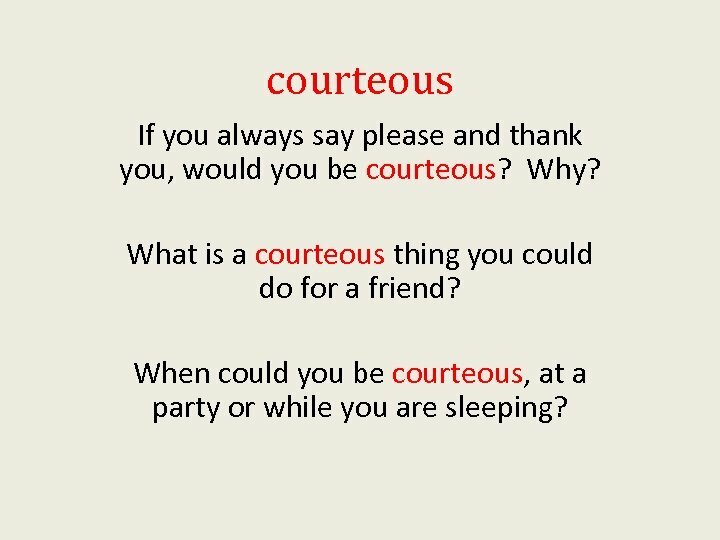 When could you be courteous, at a party or while you are sleeping? 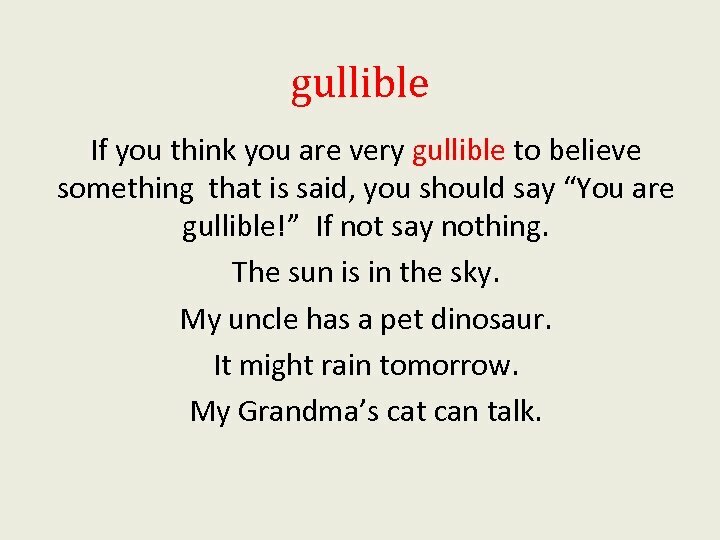 gullible If you believe everything you hear, even silly things, you are gullible. 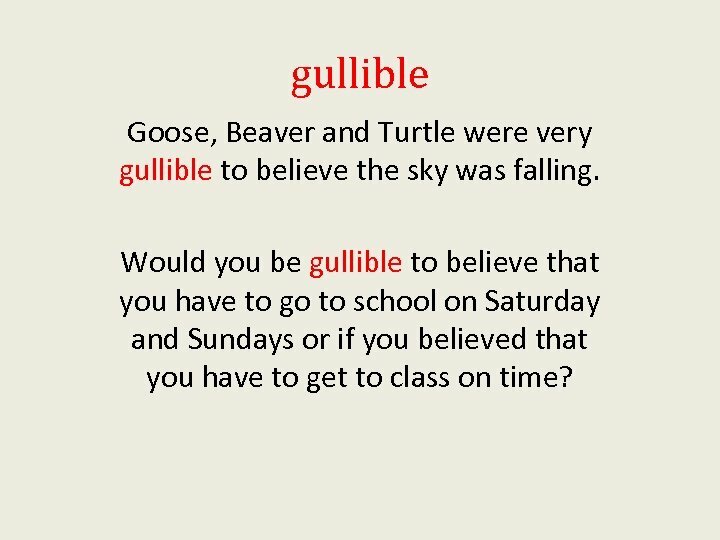 gullible Goose, Beaver and Turtle were very gullible to believe the sky was falling. Would you be gullible to believe that you have to go to school on Saturday and Sundays or if you believed that you have to get to class on time? 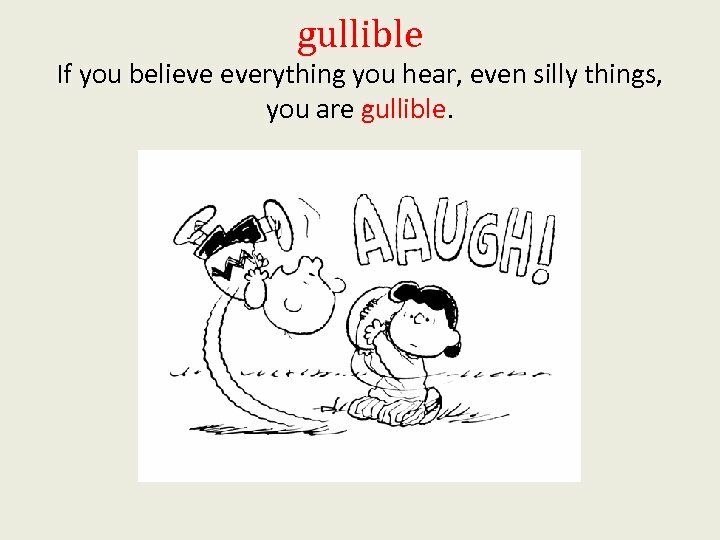 gullible If you think you are very gullible to believe something that is said, you should say “You are gullible!” If not say nothing. The sun is in the sky. My uncle has a pet dinosaur. It might rain tomorrow. My Grandma’s cat can talk. 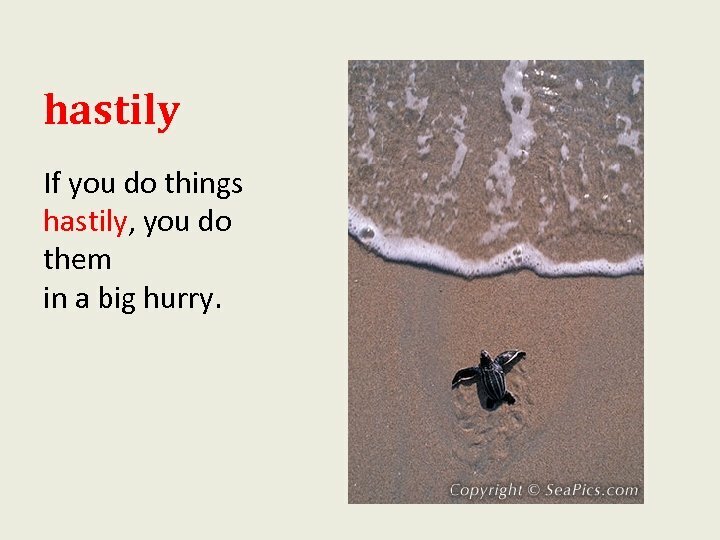 hastily If you do things hastily, you do them in a big hurry. 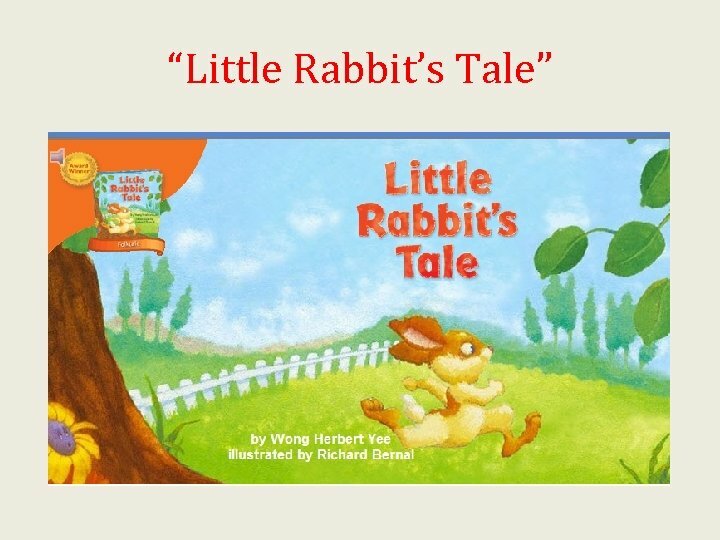 hastily Little Rabbit ran hastily to tell his friends. 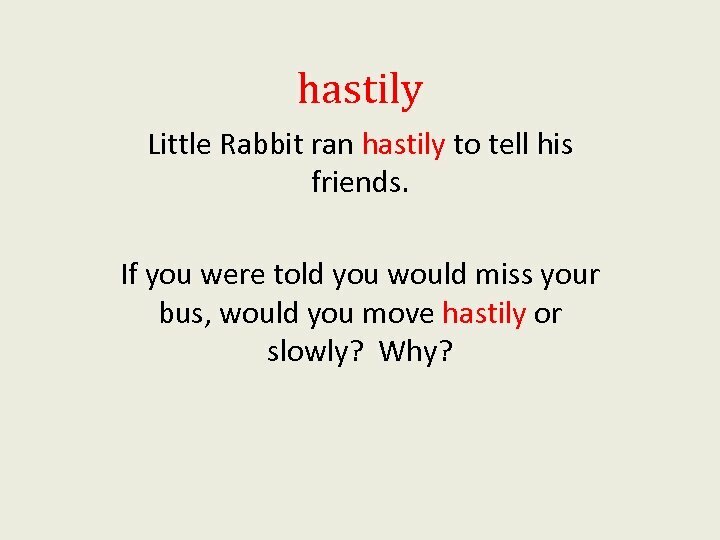 If you were told you would miss your bus, would you move hastily or slowly? Why? 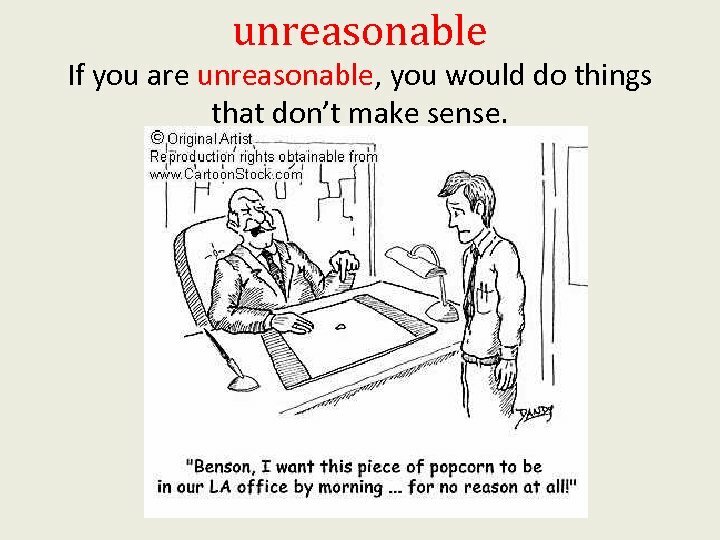 unreasonable If you are unreasonable, you would do things that don’t make sense. 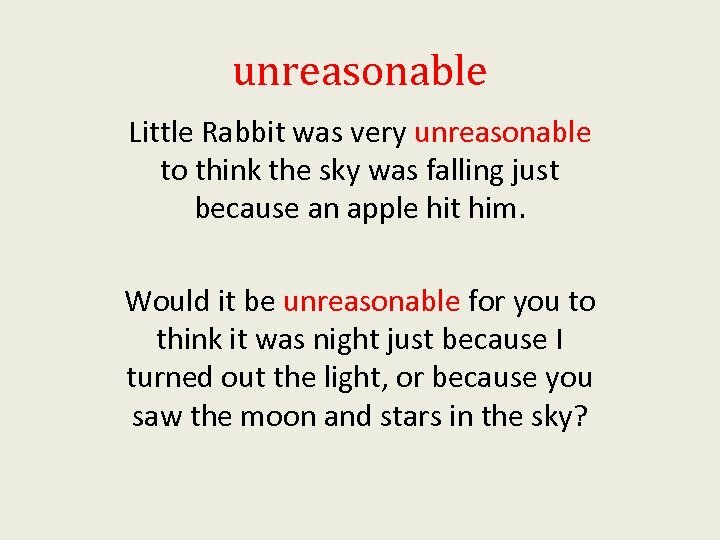 unreasonable Little Rabbit was very unreasonable to think the sky was falling just because an apple hit him. Would it be unreasonable for you to think it was night just because I turned out the light, or because you saw the moon and stars in the sky? 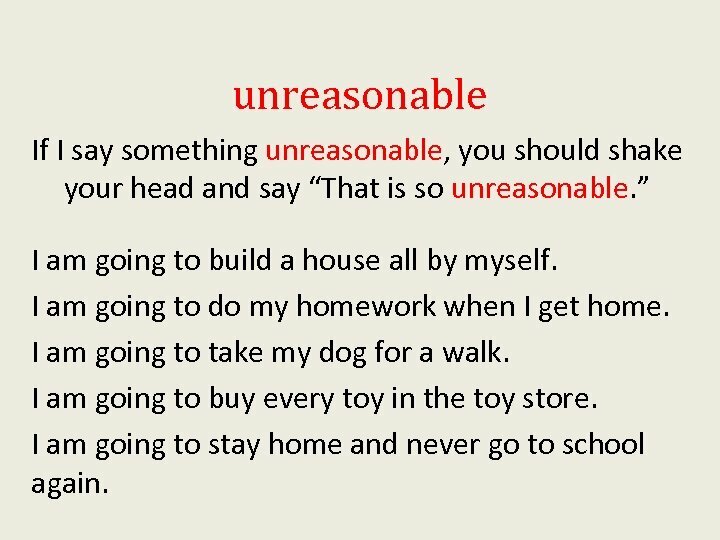 unreasonable If I say something unreasonable, you should shake your head and say “That is so unreasonable. ” I am going to build a house all by myself. I am going to do my homework when I get home. 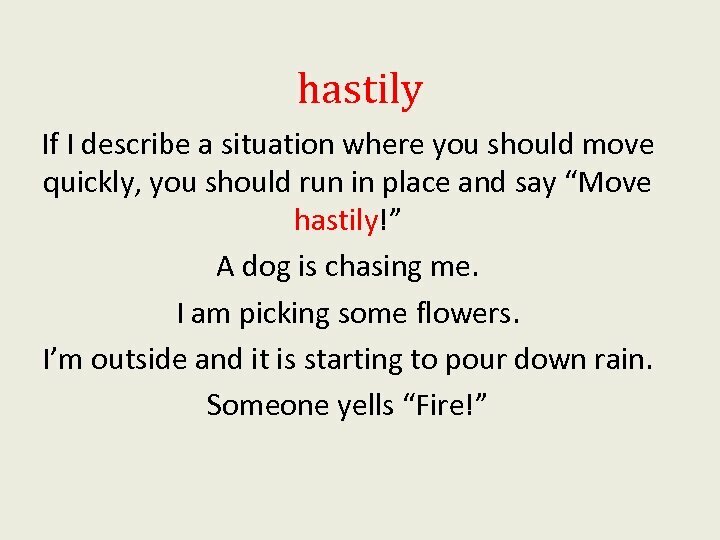 I am going to take my dog for a walk. I am going to buy every toy in the toy store. I am going to stay home and never go to school again. 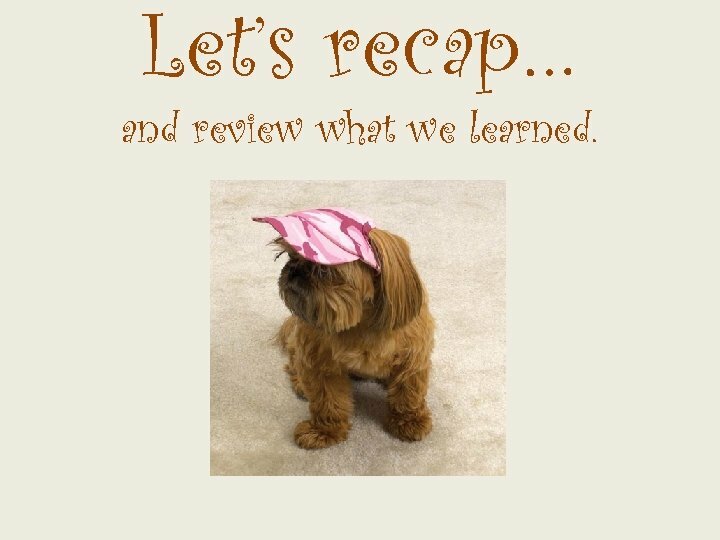 Let’s recap… and review what we learned. Fill in the blanks with the correct word. unreasonable hastily devious The children moved _______ to the car when the thunderstorm began. 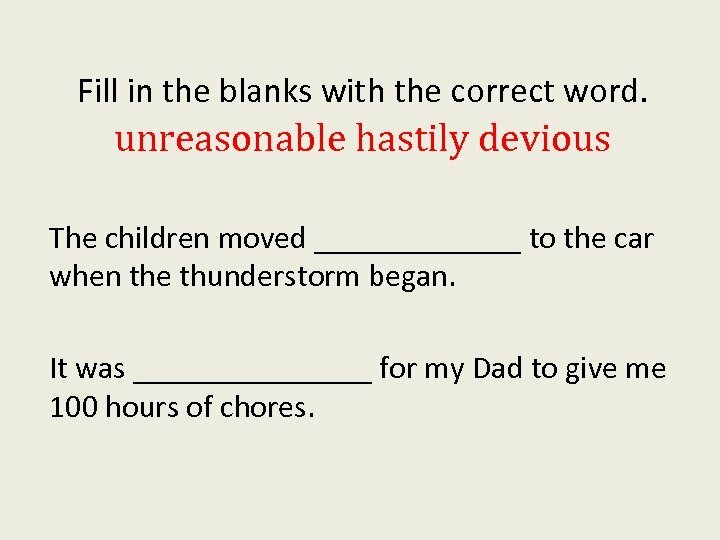 It was ________ for my Dad to give me 100 hours of chores. 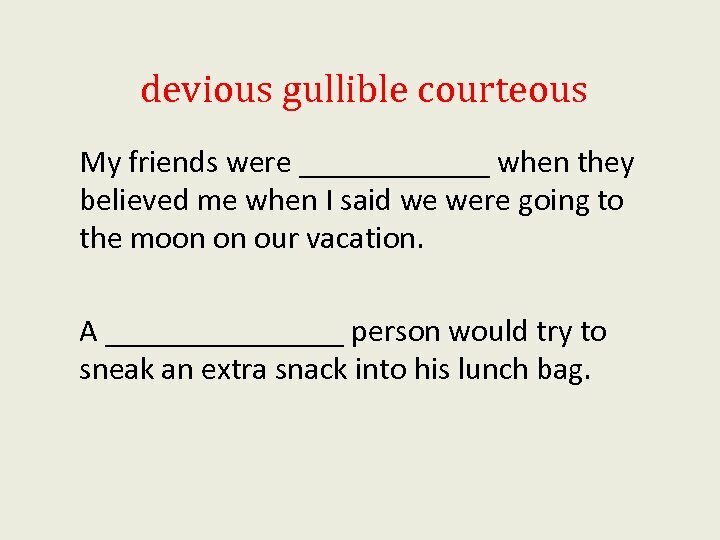 devious gullible courteous My friends were ______ when they believed me when I said we were going to the moon on our vacation. A ________ person would try to sneak an extra snack into his lunch bag. courteous rapidly gullible The boy was very _______ as he held the door for the ladies. When we heard the bell ring we walked _______ to school so we would not be late.